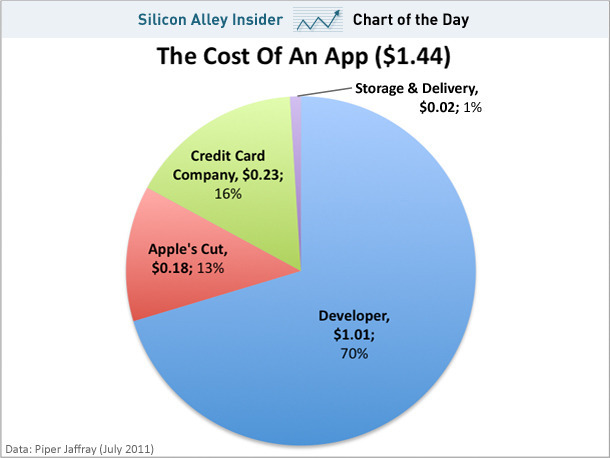 Since the App Store launched, Apple has earned a net profit of $538 million on paid app sales, estimates Munster. It has spent an additional $246 million on storing and delivering free apps, says Munster, suggesting Apple’s true profit is just $292 million. Of course, that’s the narrow way of looking how much Apple is making from the App Store. Apple’s vibrant app ecosystem has helped it sell millions of iPhones, iPads, and iPod Touches, helping it earn billions in profits. This is an interesting chart which shows where Microsoft’s profit comes from. And make no mistake, Microsoft is still the most profitable software company in the world. This is why Google is increasingly focusing on disrupting Microsoft’s core businesses, including its Google Docs rival to Office; its Chrome OS rival to Windows; and now Google Buzz, an add-on to Gmail that some have compared most closely to Sharepoint, one of Microsoft’s enterprise tools.